I really love non-flower bouquets. I mean, I love real flower bouquets as much as the next person. 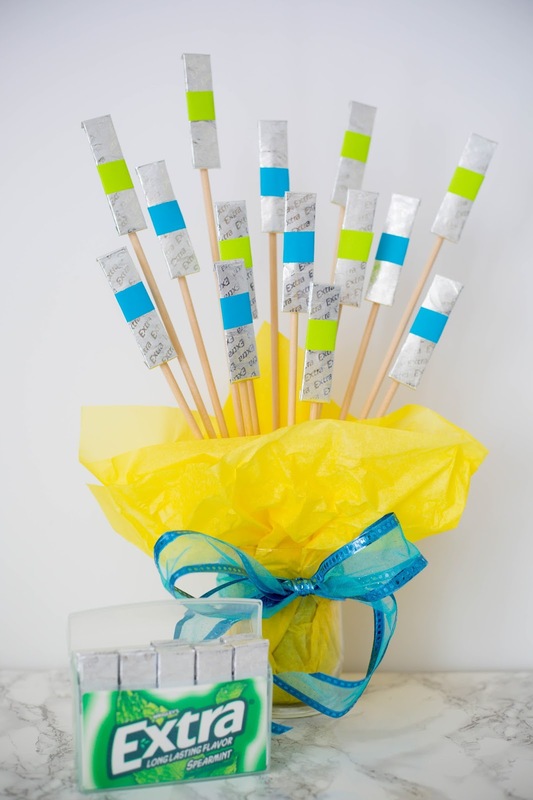 But there's something about a bouquet of candy bars and cash when you graduate high school, a bouquet of balloons for someone on the mend from surgery, a bouquet of freshly sharpened pencils (I just had to reference this one!) 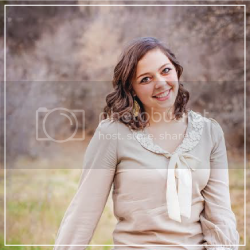 at the beginning of a school year, or anything else that lasts longer and is more useful than flowers. So when my husband told me his coworker is trying to quit snacking so much at his desk during the day, I thought of the perfect thing for him. 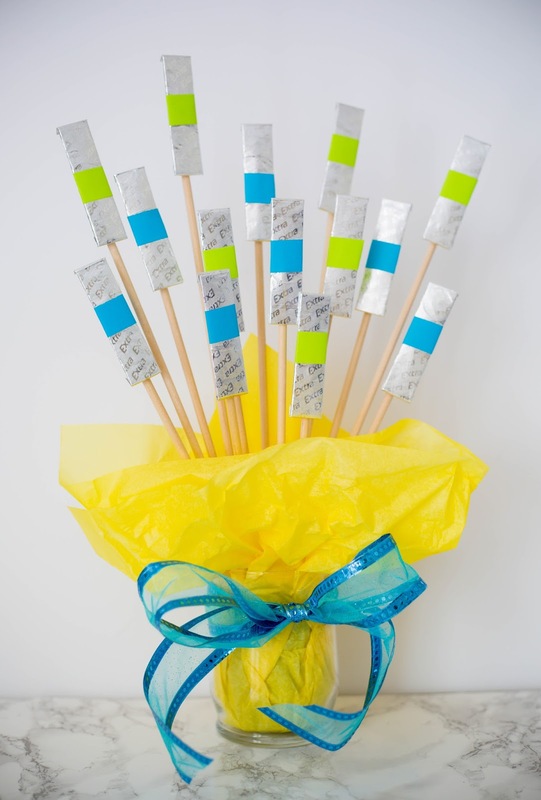 A bouquet made of sticks of gum! 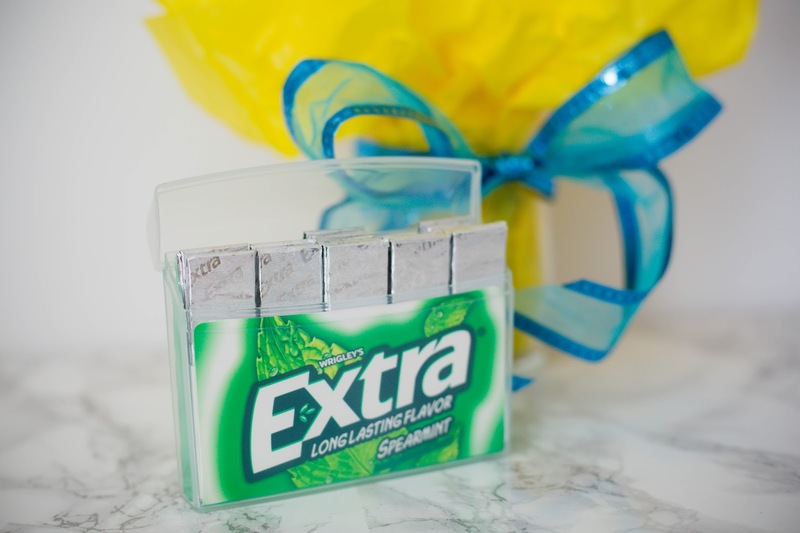 Gum is my personal favorite snack deterrent, and I wanted to try out the new bigger packs of Extra® Gum (35 sticks in one sturdy, recycled package). So I gave it a try. 1. Wrap the tissue paper around the bottom of the foam block. Place foam block in the bottom of the vase. Fan out the tissue paper around the edges of the vase. 2. 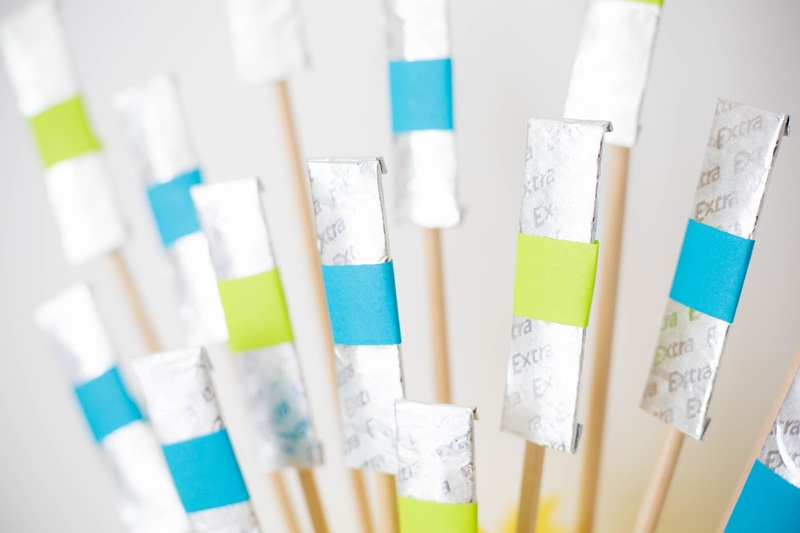 Use one piece of scotch tape to adhere a skewer to the back of a piece of gum. 4. 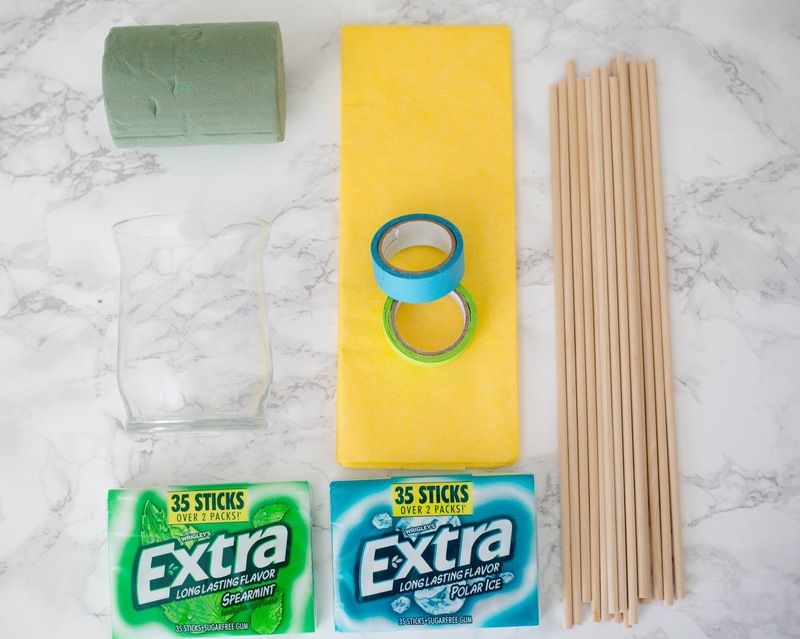 Stick each skewer in the foam block so that the gum fans out like a bouquet. 5. 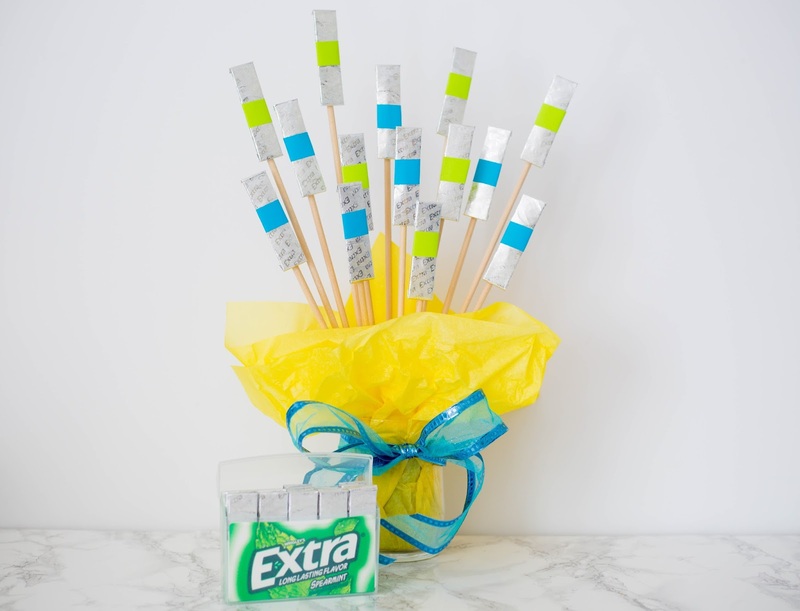 Add a ribbon for decoration, and enjoy your beautiful, useful bouquet! I keep thinking of all the uses for this pretty, easy, and simple bouquet. It's perfect for those trying to quit smoking or snacking at work. Or a baseball player right before spring training (do baseball players actually chew a lot of gum, or is that all a stereotype?). Or as a desk-warming gift for a new coworker. Give extra, get extra, right? Good thing you've got a 35-pack. You're going to need it! What are your favorite gift bouquets? Happy Monday, and happy gum chewing!